Jefferson City-based Rural Missouri magazine holds the Readers’ Choice Awards each year to honor the best restaurants, destinations and activities throughout the Show-Me State. The 2016 awards included 17 eclectic categories ranging from Best Cave to Best Pie and pretty much everything in between. Winners were nominated and voted upon via reader ballot and are slated to be announced in the April issue of Rural Missouri, which is distributed to more than 550,000 homes. Tacony Manufacturing employee Patty Lawrence nominated her employer for the award, and was randomly selected from among thousands of participating readers as the winner of a $500 Rural Missouri goodie basket. This isn’t Tacony Manufacturing’s first statewide recognition for quality. In October 2015, the company was selected by the Missouri Association of Manufacturers as a recipient of Made in Missouri Leadership Awards in two categories: Community Partner and After Market Services. The Made in Missouri Leadership Awards recognize Missouri businesses that demonstrate long-term commitment to their communities. Tacony Manufacturing is a division of St. Louis-based Tacony Corporation, a privately held manufacturer and distributor of sewing machines, home floor care and commercial floor care products, and ceiling fans. 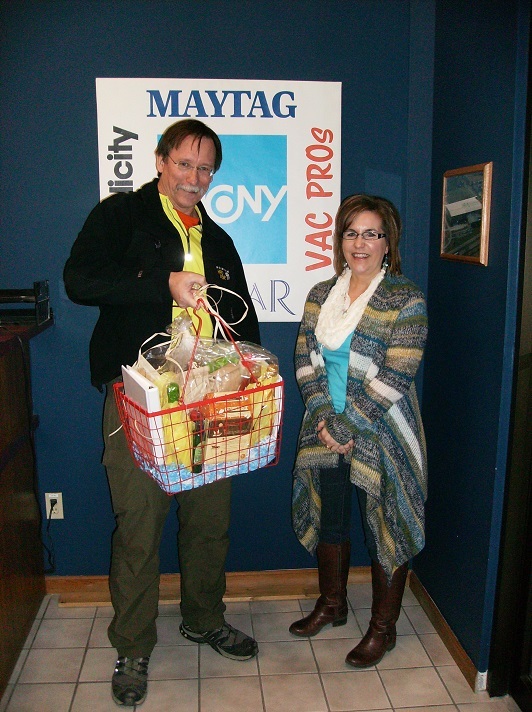 Pictured: Patty Lawrence of Tacony Manufacturing accepts her Readers’ Choice Awards gift basket from Rural Missouri Editor Jim McCarthy.